Pleated conservatory roof blinds are the ideal choice for creating shade and adding to the style of your conservatory. 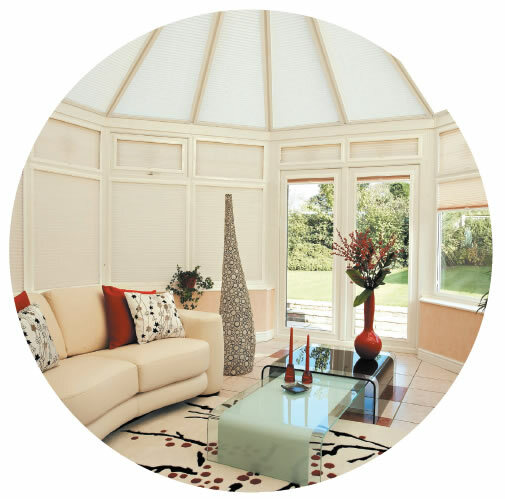 Their concertina design means that they can be opened and closed with ease, allowing you to control the light, shade, temperature, and privacy of your conservatory with little effort. When your pleated blinds are in use they’ll keep sunlight out of your conservatory helping to keep it cool, and keep heat in during the winter; and when they’re not in use they’ll be so slim and discreet that you’ll hardly notice they’re there. Here at Conservatory Blinds 4 Less all of our blinds are made to measure using a high quality specially-designed thermal insulation fabric which reflects heat and keeps out the cold. It also works to reflect solar rays, keeping your conservatory cool in the summer and preventing UV light from damaging your plants and furnishings. Thanks to their advanced scientific design, based on highly researched heat retarding and retaining technologies, pleated blinds from Conservatory Blinds 4 Less can help you to conserve energy, save money, and allow you control the climate and light in your conservatory all year round. Our stylish collection of pleated blinds is available in a great range of fabrics, with a wide variety of colour and pattern options to choose from, so you’re sure to find the perfect blinds to complement the decor of your conservatory. If you’d like to find out more about any of our blinds, or would like to receive a no obligation quote please don’t hesitate to get in touch and a member of our team will be happy to help you.